Michael Gavin—football star, war hero and philanthropist—has died. Expectations run high in his small hometown of Talking River as to who will be the one honored to speak at his funeral. None of those expectations include an obscure local newpaper reporter, Wes Watkins. Why? Wes Watkins and Michael Gavin never met each other, yet Michael leaves behind a written request that Wes deliver his eulogy. He also leaves Wes a list of names and one week to find out why. The list, people from Michael's present and past, yields more information about their hometown hero than anyone expected—and that few of them wanted to know. Michael's purpose: to teach the town the difference between a legend and a man. Wes's investigation encounters speed bumps and roadblocks right off the starting line. From his micro-managing senior editor, whose primary motivation is the revenue Wes's exclusive is sure to generate, to Talking River's high school football coach, who digs in his heels to protect the hallowed image of his childhood friend, Wes struggles against a waxing tide of resistence every step of the way. Only Michael's immediate family understand his purpose, and they lead Wes with measured steps in the right direction with enough—but not too much—information. For there's a hidden personal lesson for Wes in Michael's request, too. Mr. Garrison selects an intriguing premise for his debut novel and follows it through with a great narrative style. 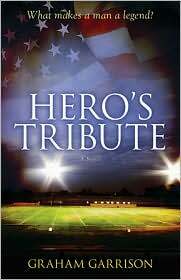 I wish my first novel read as well as Hero's Tribute does—okay, I wish my fourth one did! Delivered in a distinct and engaging voice, Mr. Garrison paces his story fluidly, filling in flashback narratives at just the right time to propel Wes's investigation—and our enlightenment—to a startling ending. We stumble into plot twists along with Wes—one of the most surprising epiphanies coming at the hand of the adorably precocious Addy, Michael's young daughter—as gradually we absorb the lesson Michael is so intent on bequeathing to Talking River. Excellent story, solidly written and definitely worth the read.